What Got You Hooked on Crime, Friederike Schmöe? Today I’ve invited Friederike Schmöe, one of my oldest friends on Twitter, in the hot seat to answer questions about her life of crime. I got to know Friederike in my professional capacity first, as she is a university lecturer and linguist interested in cross-cultural adventures, but then I discovered her crime novels and I’ve been a fan ever since. She’s written 12 novels featuring gentle yet stubborn academic Katinka Palfy from the University of Bamberg, and 7 featuring feisty ghostwriter Kea Laverde from Munich, as well as several standalones (including a couple for young adults). Despite her productivity and longevity in the German crime fiction landscape, her work has sadly not been translated into English yet. If there are any publishers or translators listening out there, you are really missing out! The world needs more independent, no-nonsense detecting heroines like Kea and Katinka. 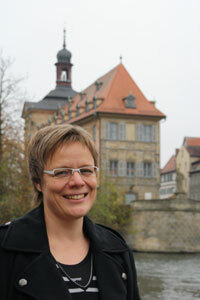 Friederike blogs in German but can be found tweeting in both English and German under the handle @123writer. How did you get hooked on crime fiction? I’ve been reading detective fiction ever since I was able to read. As a child I was captivated by unsolved riddles. The older I get, the more I feel that crime fiction reflects the distortions in our world. People aren’t saints and everyone makes mistakes or becomes guilty somehow, even though his or her intentions may be honest. In some cases, these distortions end up in tragedy and disaster. This is reality – mirrored in crime fiction. Are there any particular types of crime fiction or subgenres that you prefer to read and why? I have a crush on Nordic crime fiction. I love the sound in Scandinavian literature. Don’t know where that soundtrack comes from – maybe it is induced by the overwhelming landscapes up there? Generally I browse the book stores for novels that take me to interesting places I haven’t been to yet, anywhere in the world. I don’t like serial killers and graphic slaughter scenes very much: all those paranoid murderers are overrated in my opinion. I adore stories where ordinary people get involved in something. I also want to laugh from time to time. That’s why I like to choose books with quirky, witty characters. And I appreciate real characters with a background, doubts, hopes, desperation, dreams, humour, not just the usual love affairs and burnout crises. What is the most memorable book you have read recently? Hard to pick just one out of so many good ones I’ve devoured lately … Well, let me name Gisa Klönne and her sequel about Hauptkommissarin Judith Krieger, a tough, cool detective chief inspector with pronounced views about life and a deep loneliness in her heart. If you had to choose only one series or only one author to take with you to a deserted island, whom would you choose? First book featuring Kea Laverde, published in 2009. What are you looking forward to reading in the near future? I have Deon Meyer’s ‘Seven Days’ on my shelf. I’ve been told he is a gorgeous writer. Plus, the book is set in South Africa, where I’ve never been, so it will be a kind of holiday for me. Outside your criminal reading pursuits, what author/series/book/genre do you find yourself regularly recommending to your friends? 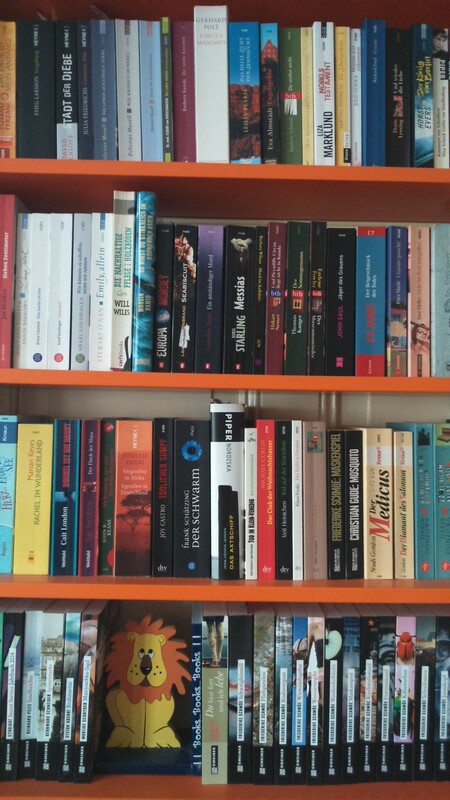 Biographies, family sagas, short stories, travelogues. I’ve just discovered a most outstanding writer, Nino Haratishvili, who wrote a 1200-page novel about the history of a Georgian family in the 20th century ‘Das achte Leben’ (Eighth Life). Incredibly gripping, though no crime fiction. The genre is not that important to have a thrilling reading experience, as long as you have a book in your hands where you can lose and find yourself in its pages. Thank you, Friederike, for some very unusual suggestions – hopefully we can find some of them in English, as my Georgian and Russian are non-existent to rusty! If you read German and would like to find out more about Friederike’s books, all of them are available to order online and you can see a list on the author’s website. For previous participants in the series, just follow this link. If you would like to take part, please let me know via the comments or on Twitter – we always love to hear about other people’s criminal passions! Nice to see one of my own twitter friends here! It’s interesting how Nordic and other Scandinavian crime fiction can cast a spell, isn’t it? And you’ve given me some new writers to explore. Wishing you success with your own writing! There is something about those long, dark winters which is very amenable to crime fiction (although I understand that crime is actually rather low in those countries). Pleased to see that my friends are friends with each other too! I so agree about wanting to laugh sometimes – there’s been a real upsurge in authors recently, I think, who can achieve that without it being at the expense of a strong story. I don’t seem to have found many of those humorous writers – other than Irish ones – in crime fiction, so I hope you can recommend a few! Thank you for introducing me to new writers here! And I totally agree… Having ordinary people with normal lives getting involved in such situations is a lot more fun than the larger-than-life portrayal. Wit and quirky humour are an added bonus! I had to laugh at Friederike’s comment about love affairs (turned bad) and burnout – sounds like most detectives nowadays – perhaps that Nordic influence? What a shame her books have not been translated in English! I am a fan of Nordic noir even if I have not read any for a while. Thanks for replys and suggestions! And thanks to MarinaSofia for the interview! Besides, Darya Dontsova (this is the English transliteration of her Russian name) is translated into English. Nino Haratischwili writes in German.